Congratulations, you have just arrived at the best page on the Internet for learning how to play poker online! If you are brand new to Internet poker, we recommend you read to the bottom of this page, then read each remaining page in the guide. If you already know a bit about Internet poker but want to learn more, check out the left side of this page where we have listed every page in our guide. Click any of the links in that menu to instantly get the answers you need. The last piece of info we need to get across is that much of this guide uses examples, and for almost every example we have used the Full Tilt Poker room. Full Tilt is our #1 ranked poker site, so we thought it would be appropriate to use them as an example. If you would like to follow along with the examples, visit www.FullTiltPoker.com in a new browser tab. Ok, so without further ado, let’s get into it. The entire subject starts with one question – “What is Internet Poker?” Quite simply put, Internet Poker is any poker game that is played over an Internet connection at Internet Gambling sites. Amazingly, the elements that make up an Internet poker game are quite similar to the elements that make up a live poker game. In real life, players drive on roads to a casino. On the Internet, players navigate between web pages to arrive at the virtual casino. In real life, players sign up for a “Player’s Card” and walk through the casino to the poker room. On the Internet, players create a player account and download the poker room’s software. In real life, once a player has reached the poker room, he visits the cage to purchase poker chips. On the Internet, once a player has downloaded the software he visits the “Cashier” to purchase poker chips with a credit card or other deposit option. In real life, after buying chips a player visits the front desk to sign up for the poker game they want to play. On the Internet, players browse through the poker room’s “Lobby” to find the game they want to play. In real life, once a player has found the game he wants to play, he sits down at the table and starts playing. On the Internet, once a player has found the game he wants to play, he double clicks the game to open the poker table and start playing. In real life, all the players sit at the same table, and a dealer deals the cards and handles the bets. On the Internet, each player has an “avatar” that represents them at the table, and the poker room’s software deals the cards and handles the bets. Everything really is the same! Just like at a live poker room, players on the Internet can play different games (Hold’em, Omaha, Seven Stud, etc), play different stakes (Internet stakes start at $0.01/$0.02 and go as high as $2,000/$4,000), play different variations (Internet poker rooms offer cash games, sit and gos, multi table tournaments, heads up matches, etc), and withdraw their money when they are done for the day. Multi-tabling – at Internet poker rooms, players can play more than one table at the same time. In fact, most rooms allow players to play 16+ tables at once! Micro-stakes – most Internet poker rooms offer cash games starting at just $0.01/$0.02 and sit and gos/tournaments starting at just $0.10. Live casinos could never afford to pay a dealer to deal such small games. Freerolls – on the Internet, players can actually enter freeroll tournaments that have real money prize pools, but are free to enter. Crazy Variations – Some sites offer really whacky tournaments, like the “Cashout Tournaments” at Full Tilt Poker where players can cash out of a tournament at any time, or the “Step Sit and Gos” at PokerStars where players can work their way up a ladder of sit and gos to qualify for major tournaments with minimal investment. I’m sure you understand by now, but we really love Internet poker! The online game offers so many opportunities that live casinos never could, so we highly recommend testing the waters, at the bare minimum. 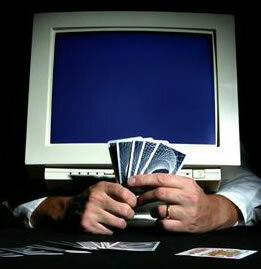 Next Article » Is Internet Poker Legal?